Metal roofing has long been associated with some of the most durable roofing structures you can think of. While it’s not considered the most durable roofing material of all, metal is quite strong and can withstand the torment of a powerful storm as well as the abuse of hail or snow storms. What metal really excels at is being a practical roofing material that not only lasts for more than 50 years, but also doesn’t require much maintenance by a Dallas roofer. A typically energy efficient roofing material, metal also protects your home by reflecting excess UV radiation and heat away from it. So it’s basically an excellent choice for a cool roof that can be used in the southern parts of the country, where the weather is much hotter and more unpredictable. The energy efficiency of metal roofing comes in when you need to plug in your HVAC, either during warmer summers or cold winters. A metal roof will protect your home quite efficiently from excess temperature fluctuations, reducing the amount of energy you’ll need to power your boiler, AC system or heating system. 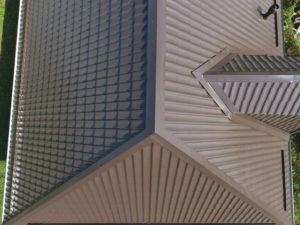 Finally, metal roofing can also be quite aesthetically pleasing, and its design is usually easy to customize. You can have your contractor prepare a cool and unique design that only your home will display, and the cost will be much less taxing, when compared to other beautiful roofing choices like slate and wood shingles.